One of Pillsbury crescents’ best qualities (and trust us, there are many) is versatility. With just one can, you can make an appetizer, dinner or dessert. 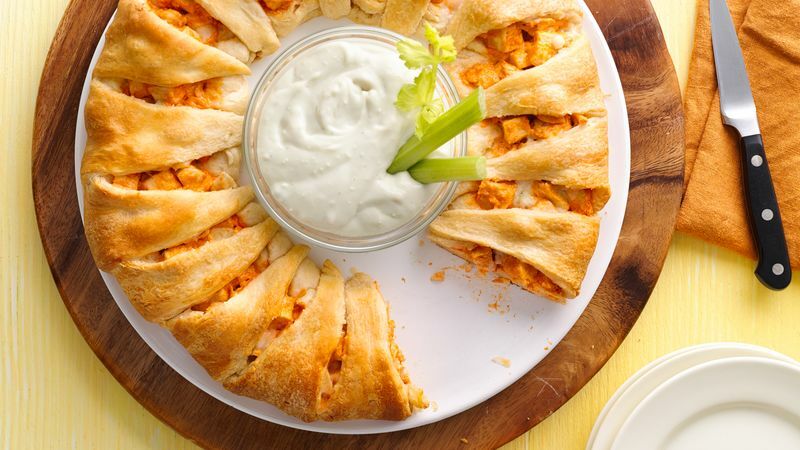 Just try our buffalo chicken crescent ring at a game day gathering, the reliable crescent dog for dinner, or sweet lemon cheesecake roll-ups for dessert and you’ll see exactly what we mean. Did you know? Our refrigerated crescent rolls have been around for more than 50 years! The first crescent rolls were introduced in 1965 alongside everyone’s favorite Doughboy, Poppin’ Fresh. With each year, we try to come up with new, stellar ways for you to use our crescent dough. We’ve pulled together over 30 of our favorite crescent roll recipes to get you started! Crescents, we love you just the way you are, too. That’s why we also turn to a can of crescent dough when we are in need of a side bread to round out dinner. Roll them as instructed or impress your friends and family with some decorative crescent hacks (we promise, they’re easy!) With a few slices, twists and folds, you can transform crescent roll dough into buns, stars, mini swirls or even rosettes. Pro tip: However you roll your dough, it’s important to keep your crescent dough refrigerated (not frozen, it’s not made to freeze) until you are ready to bake with it. The warmer the dough, the harder it is to work with and keep its shape. Always use chilled dough for best results. Once you’ve mastered the techniques of turning cans of crescents into beautiful side breads and other tasty dishes, try baking with our other products, like biscuits and pizza crust You’ll find they are just as versatile and delicious!